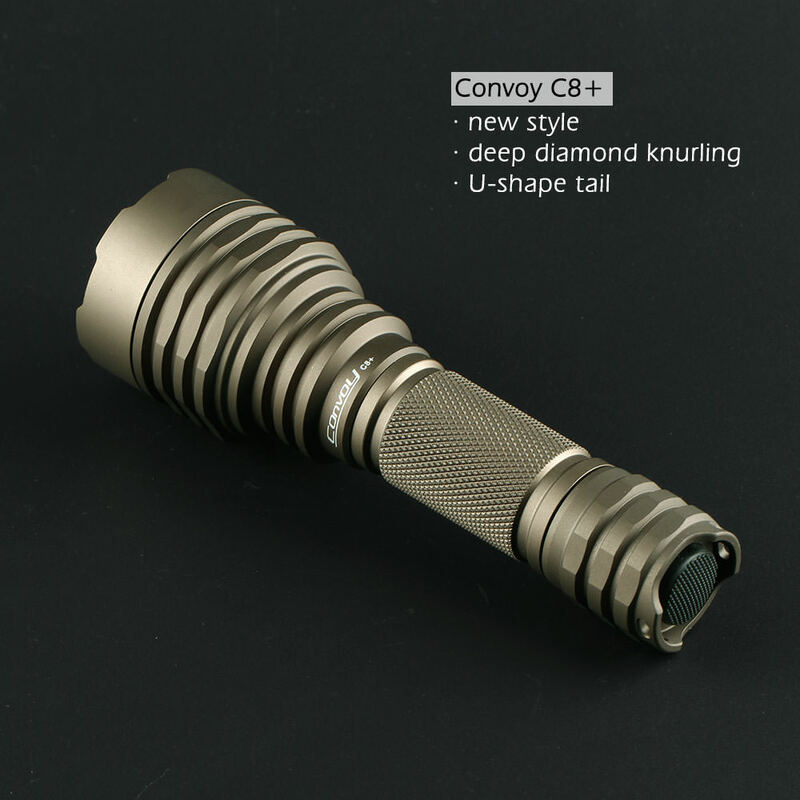 The new Convoy C8+ is available in the Convoy store HERE now. It’s only avaialble in Desert Tan at the moment but if the light is well received more colors will certainly follow. I’ll update this post later with more pics and info. I should have had this posted over a week ago. Too busy. I wouldn’t be surprised if someone has already posted about it here. Those of you who have been asking for more aggressive knurling should like this one. Bistro firmware? Didn’t you mean by accident Biscotti? Nice add to the collection! 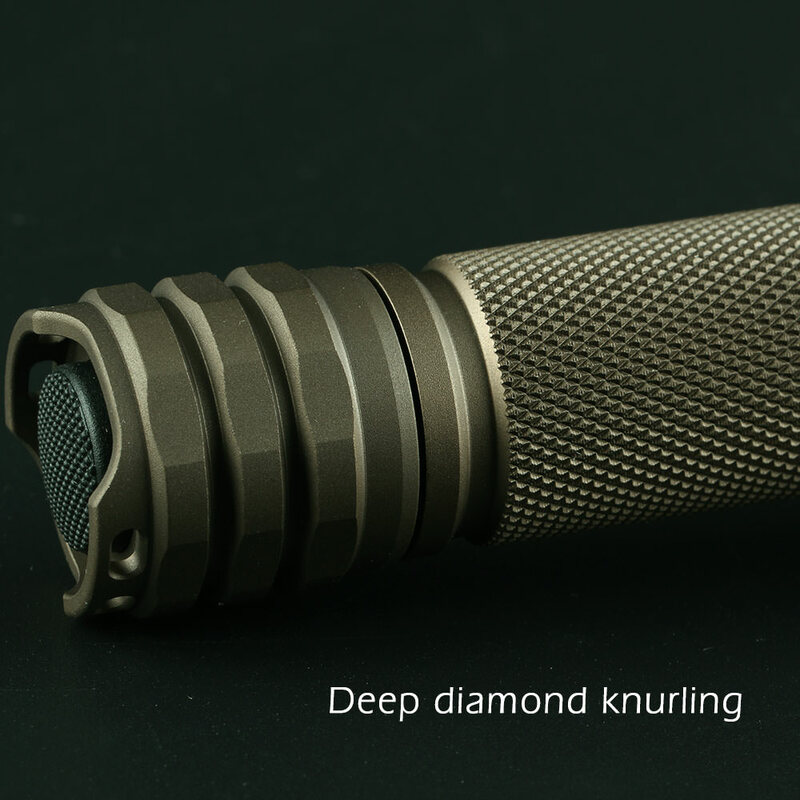 Love the color, full round battery tube and Aggressive Diamond Knurling!!!! I Love’s me some Finnish Beauty! Well done Simon, well done! And yes, Biscotti… JDub is tired. I’m going to wait until Simon offers a host version. Simon, congratulations. This is the flashlight I would give to my daughter. (That is how highly I think of it)! This thing reminds me of the Surefire M6-CB Guardian with its big Tail button. That is the highest regard to how it looks. As Dale said…JDub is tired. Don’t know what y’all are talking about though. The OP clearly says Biscotti. Finny? I think you mean Fintastic! I definitely like the new look better than the old C8 body style. And the color looks nice too! Good job Simon! I like it much better than the older version. Great color too. I would love to see it in a triple build like the Sofrin CF8. kiribaru used to make a triple spacer for the C8… But of course the Sofirn version comes with a side switch, but if that’s not important then you can always ping kiribaru about the triple spacer. Yes I appreciate the irony of that statement, but I would still love a triple! If I were developing a light and happened to be ready to announce it and someone else brought it out, my own development would be scrapped. Done already. If Simon is the enthusiast I think he is he won’t be making a reflectored C8 simply because someone else already has it. So, at the end of the day, if you want a reflectored triple C8, buy a Sofirn. Fair enough, quad it is! 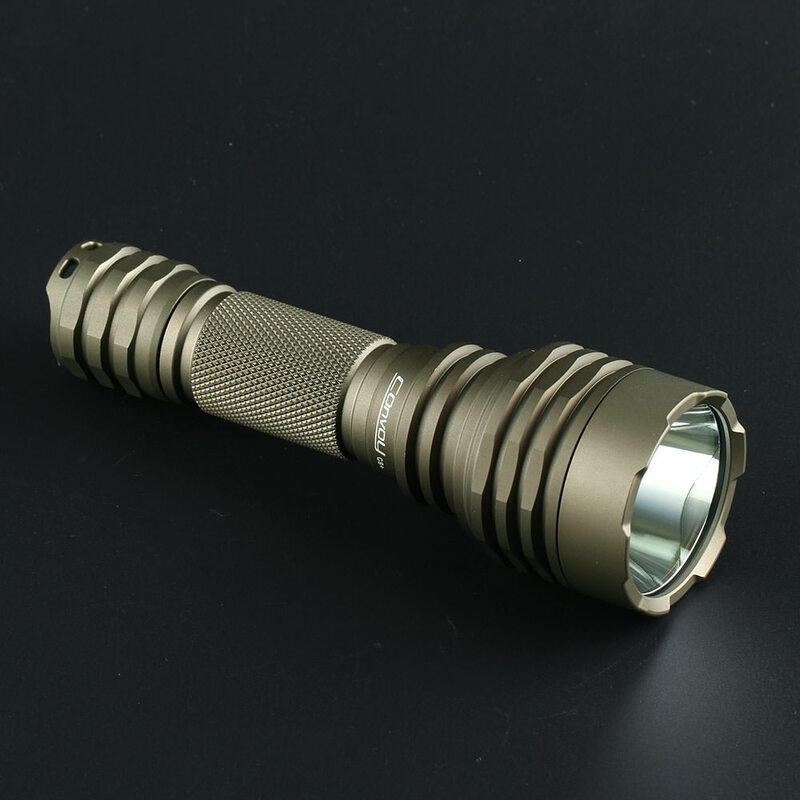 I actually did not buy a Sofrin because I try and stay away from clones as much as possible, flashlights and otherwise. If only Simon would make a 18650 extension tube for this new C8… It would open up the possibilities for more ways to mod it, using 6v or 12v leds/drivers combos. That way the “finnish” on this light can be put to good use. The C8 concept has been around for a while, I didn’t like the 3 legged style of em for a long time but of course I eventually wound up with several. I reviewed the first Sofirn triple and made some suggestions on how to improve it, as did several others, then they came out with the side switch version and they had a hit! I have always wished this size light were done something like this new C8+, much more to my liking with the fins and heavy knurling. Can’t wait to see one! Like the new look, a nice change from the much copied classic C8 look. This new design is ravishing. It just made the old C8 too dated. Much nicer than the older version. I find the design to messy for my eyes. Quite ugly actually, especially at the tail. But if cooling is better than on C8, I’m for it. That would require Convoy to adapt a new type of driver (FET or FET+7135) and Simon has been very conservative in the past with drivers, he goes for simple and limited power, probably because his market is partly outside the flashoholics community. That said, this new C8 would have no problems at all handling a direct driver like the BLF-A6. I just talked with Simon about this. He’s going to make the extension tube. Agree on all 3 points! I’ve been discussing this with Simon. Yes, he has been fairly conservative with his driver choices in the past. We have to keep in mind that not all of his market is a bunch of power-hungry freaks like us. He very much appreciates the BLF community though and I see more power in our future. Something along the lines of an A6 type driver is exactly what I’ve been leaning towards. No decisions have been made yet but there is certainly much more goodness coming from Convoy in the future. But i am still waiting for the clear anodized L2! I would like to see a 21700 c8…c9?! I’ve been discussing this with Simon. Yes, he has been fairly conservative with his driver choices in the past. We have to keep in mind that not all of his market is a bunch of power-hungry freaks like us. He very much appreciates the BLF community though and I see more power in our future. Something along the lines of an A6 type driver is exactly what I’ve been leaning towards. No decisions have been made yet but there is certainly much more goodness coming from Convoy in the future. I think the tint choice of the Convoy C8, but with the Astrolux C8 high-output driver, would be a real winner. I wouldn’t want the exact same firmware as the Astrolux (which is the BLF A6 firmware), but something along the lines of the biscotti firmware would be good. Or, for a few more bucks, an XHP35 HI emitter, along with a decent boost-driver, would give both high-output and good efficiency. IMO, that should be the next evolution of the Convoy C8. May as well leap-frog the budget competition.